Pouring a concrete pad is a safe way to prepare a site for signage. The concrete will be hard and dry when you are ready to install and the stands can be made at your leisure. To install simply bolt the plate at the bottom of the stand to the concrete base using Hilti-type expanding fasteners. Pros: Easy install, easily removable. Cons: Sign is not theft proof. If more permanence is required, dig a big hole, put the stand in the hole, and fill with concrete. Some sites do not allow concrete for environmental reasons. This means digging a bigger hole and filling with rocks before covering with earth. Cons: Time-consuming, not as durable. Always remember to check with your local Zoning and Planning Departments before installing any projects. If you have any questions, please give us a call at The Sign Studio - (818) 843-9200 or send us an e-mail at thesignstudio@sbcglobal.net. There are many ways to install an architectural signs. Here are some of the most successfully used methods along with some illustrations for you to decide what will work best for the look you are trying to obtain. Pros: Good looking, easy to change graphic. Adhesives provide an alternate mounting method. Options include liquid adhesives like contact cement or construction glue and roll adhesives like double-sided tape and mounting films. Pros: Can be very strong, some epoxies and tapes are stronger than welding. Invisible. Cons: May never come off. can be glued into inserts placed in the receiving surface. Cons: More expensive, difficult to remove. 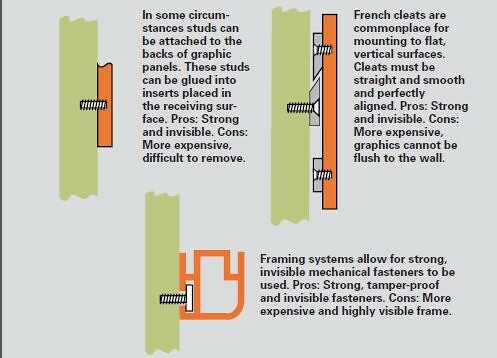 Framing systems allow for strong, invisible mechanical fasteners to be used. Pros: Strong, tamper-proof and invisible fasteners. Cons: More expensive and highly visible frame. Graphics can be mounted onto surfaces using mechanical fasteners. Pros: Strongest attachment method, easily removable. Frameclips are similar to Edgeclips except that the attachment is through the face of the graphic. French cleats are commonplace for mounting to flat, vertical surfaces. Cleats must be straight and smooth and perfectly aligned. Cons: More expensive, graphics cannot be flush to the wall. Before you select a sign for your business there are several things you need to consider. 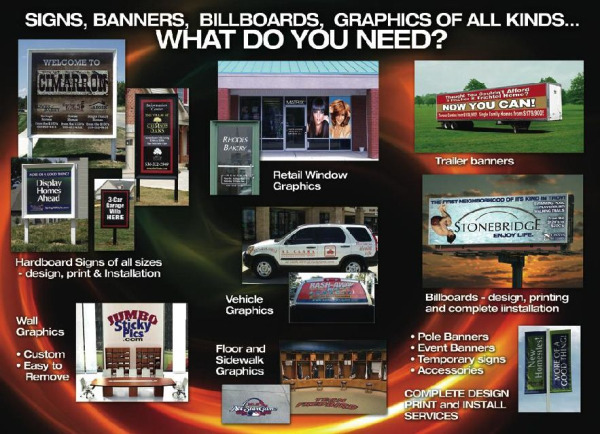 A competent sign company can help you with the answers to some of these questions if you are unsure how to obtain them. Potential customers for your business are people who reside in your trade area. Most of your customers come from the immediate area within a half mile to a mile of your business location. Trade areas come in assorted shapes and sizes depending upon the business. 2) How do you get information on potential customers? 3) How are you going to communicate with the customers? In order to communicate effectively, a sign must be noticeable and readable. A sign must be noticeable. After a while a sign becomes part of the landscape. It loses some of its ability to attract attention. By periodically changing some small design element or by using changeable copy, a sign can continue to attract interest. Time and temperature devices or rotating and moving parts can be used to maintain interest in a commercial message. Time and temperature devices or rotating and moving parts can be used to maintain interest in a commercial message. Time and temperature units also provide a needed public service. A sign must be readable. A sign needs to be large enough to read. You need to know how far a person if from your store when he first sees your sign and the real speed of traffic on your street. With this information, a competent sign company can use a formula to calculate the necessary size for your design and build you an effective sign. 4) What are you trying to say? Decide on a message that is clear and simple. Focus on key words. Choose one or two words which describe your business. Clever or strange names may only attract certain customers. Be Brief. The cleaner and clearer the message, the more impact it has. Listing or names or unclear symbols confuse rather than communicate. 5) What image are you trying to portray? Design of your sign is very important. Your sign tells people a lot about your business. Stark simple design and materials may suggest discount prices and no frills. Elegant and expensive sign materials may suggest luxury goods and services. Two basic design considerations are important when ordering a sign. Physical elements of sign design. These include considerations such as size, placement, materials and structure. The size of the sign is an important consideration for your business. The biggest sign that you can afford may not necessarily be the best one for your needs. A sign which is either too big or too small will not communicate your message effectively. The number of signs is also important. Too many signs compete with one another and reduce the effectiveness of your message by presenting an image of confusion to potential customers. The materials used for your sign determine its appearance and performance. For example, differences in cost, appearance, color, durability, flexibility and reaction to extreme weather conditions can be found in the many types of plastics available. The structure of a sign also contributes to its effectiveness. Pole covers and cantilevered construction help portray an attractive message. Graphic elements of sign design. Graphic elements of design include layout of the message, colors, lettering, shape symbolism, harmony, and daytime versus nighttime lighting conditions. Legibility is a test of good design. If your sign is well designed, it will be easy to read. Legibility means that the letters or characters on the sign are distinct from one another. Some color combinations of background and letters give excellent legibility while others are very poor. To test your sign's legibility, drive past your business and see if you can read it from a distance. Look at it both day and night. Some signs are difficult to read because of illumination problems such as glare from street lights, signs on nearby business establishments, or shadows caused by buildings. A well-designed sign blends with the environment, has a message impact and overcomes viewing problems. A sign is an investment. Your sign is one of the most permanent parts of your business and is exposed to weather and constant use. The average life of signs varies from five to eleven years, depending on type of materials used, construction and other factors. Find out how many years of service to expect from your sign. It pays to purchase good materials if you intend to use the sign over a period of years. Maintenance costs. No business can afford to have its sign fall into disrepair. A dilapidated sign tells the public that you are not concerned with your business image or their visual environment. Some types of signs are virtually maintenance free while other require more attention. Find out how to replace burnt out bulbs or tubes in your sign. Energy consumption. New technological developments now enable some types of signs to achieve energy savings without sacrificing effects. Inquire about new energy saving bulbs and internal materials. Owning or leasing. This may be more economical for a new business, especially if there is any chance that logos or names may change in the first few years of operation. Statistics show that if a small business fails, it will happen somewhere between the first and second year of operation. Leasing a sign during this period of time might help save some of the initial capital needed for operating expenses. 7) Signs communicate in a shared environment. A sign's ability to send its message beyond its locations requires that you be sensitive to the effects of your message on others. Since you share your space with others, consider their rights and sensibilities too. They are potential customers. Consider city or town planning goals and regulation when ordering a sign. Some types of signs are not permitted. Determine what the regulations are in your community before you discuss design with a sign designer. Most sign companies are well aware of the regulation in any given community and can guide you in selecting a sign which is not in violation of the law. What is the DURABILITY OF VINYL VEHICLE GRAPHICS? Durability of vehicle graphics is often a grey area. Some seem to last forever, others deteriorate quickly. Clients spending big money on a vehicle wrap are often concerned about this issue. The big question always is, how tough are your vehicle graphics? What is the warranty? • The quality of the mounting surface. • The quality of the graphic products used. • The installation methods used. • Maintenance of the graphic during its lifetime. The type of surface that the graphics will be mounted to has a major, but often overlooked, role when it comes to the long-term durability of vehicle graphics. For example, if the vehicle no longer has its factory paintjob, the quality of the repaint has a major effect on the adhesion of the graphics. The graphics might stick well to the paint, but if the paint doesn't stick to the vehicle, all is lost. Some unpainted vehicle surfaces, such as aluminum truck boxes, stainless steel tanker bodies or fiberglass box walls, may interfere with proper adhesion as well. Some graphic films specifically void any warranties on such substrates, others recommend various surface preparation techniques before application. Check with the manufacturer and proceed with caution. Preparation of the mounting surface prior to installation can have a huge effect on any graphic's durability. Not only must the vehicle's surface be squeaky clean, but all surface waxes and/or remnants of polish compounds should be removed as well. This can be done using a clean soft cloth and rubbing alcohol. A poorly prepared mounting surface will virtually guarantee early failure of an otherwise perfect wrap. The single largest factor in graphic durability has to be the graphic itself. This is a complex mix of print media, ink and overlaminate. All three items have to be carefully matched for maximum compatibility. Fortunately, manufacturers and sign professionals usually offer recommendations on which combinations work the best for their products and installations. Those with warranties only offer the maximum guarantees on specific tried and tested product combinations. Warranties on products range from one to seven years depending on the inks and overlaminates that are used. Recommended products are Avery Denninson, 3M, MACtac, Oracal and Arlon. All products offer different warranties so make sure you ask your Sign Professional what products they use. Installation techniques are another critical aspect that effect long-term durability. Manufacturers' directions for each type of graphic material give specific instructions for installation that should be carefully followed. Special care must be taken when conforming the graphic film around complex surface shapes. These are the most likely areas to fail later. The more complex the surface, the more chances there are for tenting. The more cuts that have to be made in the graphic panel in order to make it fit the shapes, the more chances of edge failure. The more stretching that has to be done over convex shapes, the more chance of film cracking in the future. Anyway, you get the idea. Anything that you have to do to the graphic to alter its factory shape will affect long-term durability. Maintenance after installation is the most overlooked aspect of durability for vehicle graphics. The client who might never consider missing an oil change might not help his wrap continue looking its best simply because they don't understand how to keep it safe. Keeping the vehicle clean and free from dirt, grease, salt, acid and drew build-up will help tremendously to extend the life of the wrap. The non-vertical or horizontal areas of a vehicle graphic can be the most challenging areas in which to maintain durability. • Cleaning the vehicle should be done with a liquid, nonabrasive cleaner that has a ph value between 3 and 11 and no strong solvents in it. • If using a pressure washer, make sure it has less than 2,000 psi of pressure; and hold the nozzle more than 12" from the graphic surface. • Special care has to be taken around exposed graphic edges as well. Wash the vehicle with a soft cloth or sponge, not a hard brush, and avoid excessive scrubbing. • Checking the graphic regularly can also help to prolong its life. Loose edges should be promptly repaired using an edge seal product. 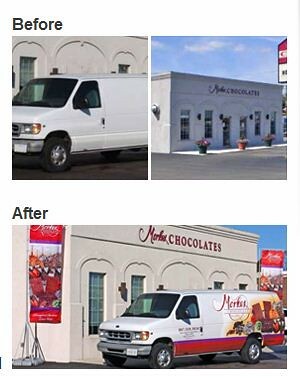 Vehicle graphics can last a long time, or a short time. Either option may be required on any particular project. The short-term graphic is easy, but the long-term graphic requires planning, expertise and maintenance. It involves a delicate partnership between manufacturer, producer and client, but can produce amazing results when all of the stars are aligned. - Prior to installation, not only must the vehicle's surface be squeaky clean, but all surface waxes and/or remnants of polish compounds should be removed as well. - Maintaining a wrap's good looks involves some effort from the client, such as using non-abrasive cleaners, avoiding stiff-bristle cleaning brushes, and checking frequently for loose edges. - The quality of the installation will also affect a graphic's chances at long term durability. Careful attention to detail, making sure not to over-stretch the vinyl over curved surfaces and using a minimum of cuts and pinholes all add up to a more durable graphic. - Failures generally happen first along areas where the vinyl was stretched to conform to dramatic surface features. There is an old axiom that the 3 keys to successfully selecting real estate are "location, location and location". The 3 keys that guide the successful selection and development of commercial properties are Visibility, Accessibility and Parking. One measure of how effective or valuable an on-premise sign is to its site is demonstrated by how well it helps to brand the site. A sign "brands" a location, just as a product label brands the product. If an attractive image is not communicated by the business' sign, the business will rarely convey its true message, or get the clientele it seeks. advertisers (i.e., television and newspaper advertisers rely on Nielsen Ratings Services). Small business owners not engaged in franchised or chain business operations, however, usually do not have access to national rating service readership tabulations; these independent small business owners may require the services of a local market researcher to obtain readership measures. Often, on-premise sign companies and trade associations will assist in compiling data. Why do you want to measure readership? Without knowing the effectiveness of your signage, you won't know how well you are doing, or what you might want to change. For your greatest success - with a sign and therefore with your business - measuring readership is a diagnostic tool so you can fix whatever is not working, and increase what is working. Derived from counts taken at the driveways of various land uses, not all trips generated at the driveway represent new trips made for the express purpose of entering the site; instead some are made by motorists who did not set out for the site, but who enter it as an intermediate stop on the way to or from another destination. This type of stop is referred to by the Institute of Transportation Engineers (ITE) as a "pass-by trip"; for our purposes, it is defined as an "impulse" stop. estimates regarding the percentage of stops attributable to motorists for whom the site is not a scheduled destination. The table demonstrates that impulse trade is very important to many businesses. Effective onpremise communication can help persuade passersby to stop and shop. In the modern marketplace, the right place-based advertising will effectively and economically permit the local shopkeeper to compete, even with the mass merchandiser or large retailer. Part II of the study involved analyzing seven years of weekly sales data for "Pier 1 Imports" to measure the effects of modifications, additions, or removal of on-premise signage on sales performance. Council of California, and the Business Identity Council of America sponsored the study. A summary of the findings appears in The Economic Value of On-Premise Signage, a compendium of signage-related research results and articles (e.g., sign amortization; copyright and trademark protection.) The booklet was published jointly in 1997 by CESA and ISA. 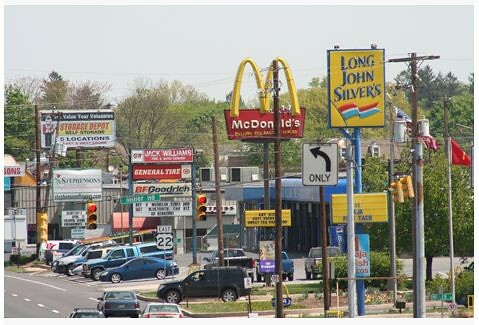 This analysis is complicated by alternative signage forms such as business form or product franchising or chains where the system is integrated into networks of retail sites supported by national advertising (media) programs. The fundamentals of valuation and evaluation start with understanding that signs are commercial speech. Additionally signs are relied upon and used by consumers to make and influence their shopping and purchasing decisions. Los Angeles Signs | Signs Are Your Marketing Tool! SIGNS AS A MARKETING TOOL! Have you considered the impact that your sign has on your business?Let's discuss what signage can do for your business, and how signs can be used to your advantage. 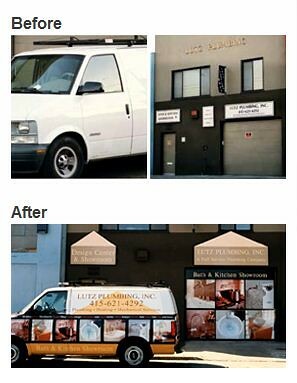 Los Angeles Signs | Sign Makeover - Revitalize Your Business! Los Angeles Signs | Is It Time To Evaluate Your Signs? Sign Makeover? Los Angeles Signs | Sign Variance - Will I need one? Los Angeles Signs | What is a Blade Sign?